The above is a quote that I have heard so many times over my life span. I don’t know who was the first one to pen these words or which is a variation of the original but when I went to research it I found numerous authors and so I shared a few of them. They all basically say the same thing, just different wording. I share them as a reminder or evidence that many people identify with this as an issue and evidently it has been an issue since the first moment passed and became a “past”. One of the reasons that the past is so often able to control and condemn us by its power is because we fail to understand the particulars of it. We don’t know why someone did something or why something happened or what made us the target or what we did to deserve it or where the people were to protect us or the answers to all of the other questions that haunt our recollections and memories of our histories. And those questions pervade our thoughts and become responsible for creating the conditions and circumstances that provoke us to hurt because of them. Those questions and the lack of resolution or closure come together to create the cultures of silence and secrecy that torment us in our present lives. We mire in the controversies of our beginnings and become slaves to the repeated mess that is constructed. And we carry and share that baggage boldly, unknowingly into our current presents and nows and whatever our futures are to be. Carrying on the trauma and tragedy to the demise of relationships and friendships, and acquaintances, alike. We destroy our lives in the shadows of our darkest moments, and then we repeat them for lack of acknowledging or understanding them. And they become the learned behaviors that we teach and repeat in our actions and language. They become our traditions and routines and legacies. Or we can study them. Study YOUR past. I am not ascribing that YOU become a student of YOUR past, YOU were already a student of it. and YOU sat in that class, YOU came early, YOU had detention, YOU took summer course in that class. I don’t recommend that YOU continue to subject YOURSELF to that anymore. But now YOU must review for the “test”, the one YOU must “pass” in order to get to the next level. It’s time to go over what YOU learned, why YOU had to learn it, and what it means for YOU to know it. Studying in this sense is done by YOU taking note of what happened. YOU must admit that it happened. YOU must acknowledge that it happened. YOU don’t have to know why it happened, some “whys” YOU will never know and trying to figure them out may only lead to more rejection, more repetition, and more remembering them in a way that causes YOU more pain. So “why” doesn’t matter, the fact is that it happened, let’s now do something so that it doesn’t have to happen again! Studying the past is also where YOU examine YOUR own behaviors and characteristics, the good and the bad ones, in order to gain a perspective on just how little or how much things, people, and events, of YOUR specific past have affected or infected or effected YOU. Study YOUR patterns and habits. Study YOUR routines. Study YOUR words and feelings. Study how YOU handle, mishandle, or choose not to handle issues. Study YOUR reaction to triggers like places, people, music, things, ideas, and events, that cause YOU to revert or regress to old and unhealthy ways of expressing or not expressing YOURSELF. Study YOUR moments. When YOU have felt terrible, take note of the atmosphere, the surroundings, the conditions, the audience, the places, and the reasons. When YOU felt extremely well or better enough to declare YOURSELF “okay”, take note of these same variables. Seek and search to reveal the common or uncommon denominators and analyze and observe what are YOUR risk factors. Pay attention to the similarities or differences that certain of these factors produce in or around YOU. It is very healthy and recommended that YOU have someone who YOU identify with in this process. An accountability partner is great. Licensed professionals, like therapist or counselors are great observers and are equipped with the ability to help YOU recognize these things with an unbiased eye and perspective. The professional may be more ideal for YOU if, like myself, YOU have or had severe trust issues. Because the vulnerability that is required in this step may often push YOU to run back to the ugly habits of guilt and shame that are the catalyst for keeping our “past” or the things that we keep alive from our past, alive. So having a therapist or counselor to help YOU “study” is like having a tutor. The more preparation the better. And sometimes it’s hard to study with “friends”. Studying takes time too. Because YOU probably don’t have, in this context, great study habits. What YOU may have is superb memorization skills. YOU probably excel at visual, kinesthetic learning. YOU may or may not be good at comprehending which information to hold onto or which data to disregard. And YOU will have to figure that out. YOU will have to realize which parts of the past YOU study are necessary to remember and which parts are best forgotten. YOU must gain reference by way of opening YOURSELF up to the reality that YOU went through what YOU went through for the sake of benefiting someone, YOU, of course, and someone else who is suffering and needs YOUR answers. Once YOU pass the test, YOU can pass on the notes, YOU can pass on the answers, YOU can teach the class! The alternative is just as it was in school. Either YOU pass the class or YOU flunk out. Or YOU repeat it. YOUR past is a class. YOU should only have to take it once. This entry was posted in Inspiration, Love, Motivation, Poetry, Quotes, Reflection, Self-Love, Uncategorized and tagged Past, Perspective, seethepoet, Study, Truth, Your on March 21, 2014 by seethepoet. Now, run and tell that! YOU might be thinking, “… But YOU said in Step 2 that I could tear up the facts and that this was no confession!” Yes, I said that. And in regards to the facts, that is exactly what I meant. YOU have earned the right and respect to tell YOUR STORY and YOUR FACTS at YOUR PACE, in YOUR TIME. This “tell” is about what happens after that. As we have established, the facts are the facts, and there is no changing that they are true, at least about our past. YOU will eventually be able to tell them with confidence and in boldness, but until then, YOU don’t have to pressure YOURSELF to reveal or release them in a way that makes YOU substantially more uncomfortable. Just always remember though, there is nothing that we can do about what actually “happened”, it factually happened. And telling in that sense could serve us well in not just solving our own issues, but helping or preventing such in the lives of our family, of our friends, of our world! This is time to give YOUR side. YOUR “other” side. The side of YOU that the facts don’t explain. It is time to tell YOUR story. YOUR story that defines YOU or redefines YOU. YOUR story that vindicates and verifies the validity of YOUR own truth. This isn’t about confessing or complaining, this is about being convinced and being confirmed in the fact that YOU are who YOU are and that YOU are willing and ready to move forward. This “tell” is not about accepting or assigning responsibility, this step is about accountability. This step is about making the announcement, to YOUR past, to YOUR future, and everywhere in between that YOU are worthy of being someone who experiences and enjoys the NOW that is readily and rightfully available to YOU. This is where YOU tell YOURSELF that YOU ARE, that YOU CAN, and that YOU WILL, be whatever or whoever or wherever YOU choose to, from here on out! Tell YOUR past to stay put. Tell YOUR present to stay positive. Tell YOUR future to stay the course. The “tell” step is about affirmation and acclimation to YOUR own self. One of the main concerns and issues with the past is that facts of the past cause so much shame and guilt to press on our minds and bodies and that element is most often hidden or accommodated through secrecy and silence. YOU may not be in a place, or position, or comfort, enough to speak on the bad that happened to or because of YOU, but YOU can speak up about the good that YOU do want and that YOU do deserve and that YOU WILL ACCEPT and ASPIRE toward YOUR future, from now. YOU get to speak life into YOUR new “facts”. YOU get to “Say Something”. YOU have to SAY SOMETHING! Depending on the severity or level of YOUR own personal baggage and how it has or was holding YOU back, YOU need to “unpack” some things. Clearing YOUR mind is a novel and aspiring suggestion, acknowledgement is a vital component, but nature and “life” always have their way of reminding or reverting us back to places or people or problems of the past. And just as easily as YOU emptied YOUR thoughts can they be renewed or refilled to the brim of default or denial. And so YOU have to “lose” some of those bags in order to make room for what is next. I suggest writing letters. Write letters to YOURSELF about the past, about YOUR hurts. Then write letters to the people that YOU can reach or remember that hurt YOU. Write letters of forgiveness and apology. Write letters of acknowledgement. These letters can be sent out at a later date or appropriately used as journals. At the early stages of YOU “passing” the past, YOU have to deal with YOU and so it is not imminently necessary to subject YOURSELF to encounters that are not healthy or mediated properly, protecting YOU from further distancing YOURSELF from the awesome, fantastic, wholesome, trustworthy, and authentic person that YOU are. Along the way of going forward YOU are going to encounter the people that were specific to YOUR problems, or YOUR pains, or YOUR past, and those moments and instances will be undoubtedly difficult and uncomfortable if YOU are caught off-guard or by surprise and not prepared for facing them. But if YOU have already addressed the issue for YOURSELF, even if it is by letters that YOU wrote to YOURSELF, it will serve YOU quite effective in the moment of that occurrence. So for right now YOU can keep that part of it, the letters, if need be, to YOURSELF. “Telling”, in this step is also about trust. Because this step is about accountability YOU must make a concerted and conscious effort to fulfill the space in YOUR life that was made empty by silence or secrecy, both habits and traditions that are all too common in the devastating aftermaths that our life disasters leave behind. So YOU do need to find someone, be it professional or personal, that YOU can establish trust in and be comfortable and confident enough with to “tell” YOUR whole story to. Counselors and therapists are perfect for this assignment. True friendships are even better because they have an access to YOU that the professional sector may never achieve. But the truth is that YOU have to let it out, keeping it to YOURSELF will eventually do more damage than YOU can afford to recover from. As children we are told or taught that “tattling” is a bad idea. Tattling, a reference to “telling on someone”, was usually our way of expressing when we felt wronged. The adults or more responsible individuals around would dissuade us from that because it was, to their insistence, us being selfish or “naggy” or immature. And so they shamed us into developing habits of keeping our feelings and issues, things that personally affected us, large and small, to ourselves. As a child one of the worse things YOU could be was to be known as a “tattletale” or “telltale”. And the idea of it being a bad thing seems to instinctively and inherently take root in the dialogue that we learn in our earliest of years. Being a tattletale was the worst YOU could do, according to YOUR family, according to YOUR friends, and even strangers knew the rule. And so it developed into keeping secrets and remaining silent. It was reinforced by ideas and notions like “what goes on in this house stays in this house”. Eventually this manner of thought turns into us not being able to express ourselves aside of if we hurt or perceive harm. And not telling on someone else blurs the borderlines of being able to speak about our own truths and facts. And it is misconstrued as being strong to not have to “tell everything” but it weakens us and it creates the atmospheres and environments that breed the perpetuation of disastrous cycles and stigmas. It turns into our modern day “no snitching” culture. YOU know where that has gotten us. So tell! Speak out. Speak up. And when the time comes, speak on the facts that are YOURS to speak on. Because the truth is that YOU are not the only one that YOU are speaking for. And there is someone dealing with issues the same or very similar to YOURS, they need YOU to say something! They need to pass their own past. YOU could help them do that. 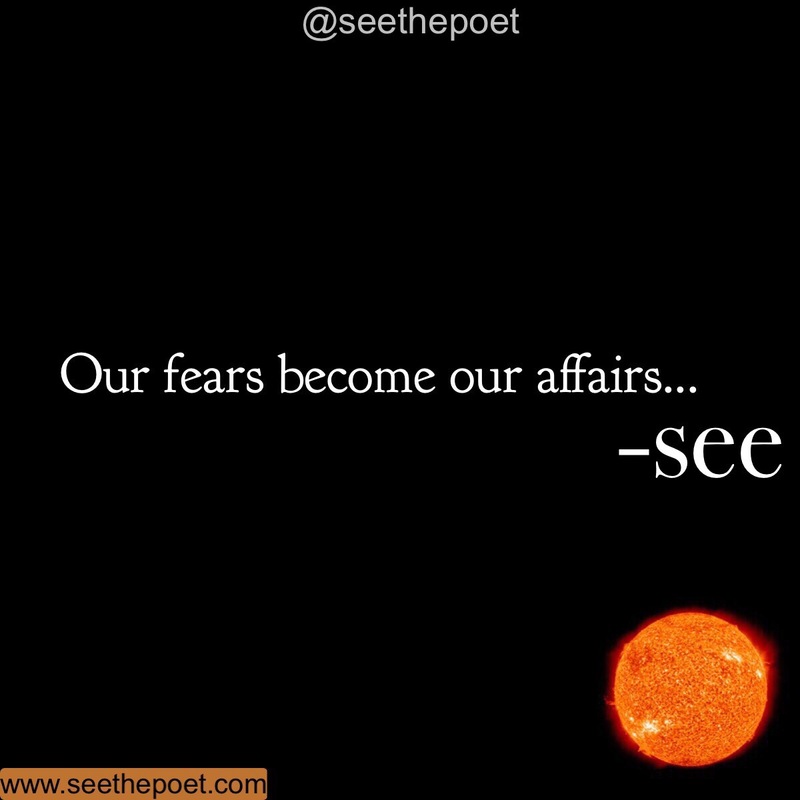 This entry was posted in Inspiration, Love, Motivation, Poetry, Quotes, Reflection, Self-Love, Uncategorized and tagged Past, Perspective, seethepoet, Tell, Truth, Your on March 19, 2014 by seethepoet. The first thing that we had to do in step 1 was to change our mind or clear out our thoughts. We had/have to clear our imaginations and mental slates of all of the cluttering debris, be it emotional, psychological, mental, spiritual, or just habitual ideas and/or memories that we identify ourselves by, for the purposes of being able to begin the work that is necessary to complete, start to finish, what we have set out to accomplish. We do that, clearing our minds, by utilizing forms of therapy such as Meditation, Observation, Visualization, and Experimenting (M.O.V.E), the formula I discussed in step 1. However long that it takes to “clear” or change YOUR mind is up to YOU. But once YOU are confident enough to desire change or find YOURSELF in a place that renders change YOUR only choice, YOU will definitely be ready. When “enough” is truly “enough”, YOU will do “enough” to M.O.V.E! And once YOU have done it, time for the next step. It is time to ACKNOWLEDGE, all of it! Sounds crazy doesn’t it? Sounds a little counter-productive. Sounds like YOU are going backwards. I know. I totally understand. I completely understand! But “acknowledging” is not remembering, or dwelling, or wallowing in, or repeating, or triggering, the past. Acknowledging is YOU being strong and bold enough to face who YOU are. And the truth is that everything that YOU have been through, everything YOU have done, everything that was done to YOU, all served to create who YOU are right now. And who YOU become after this is because of that person, the person that YOU are. So “acknowledging” is where YOU get to take back or take possession of YOURSELF. When YOU acknowledge who and what YOU are then YOU are able to identify and define who YOU want that person to be. When YOU acknowledge YOUR awareness and presence in YOUR current space YOU then give YOURSELF the ability to measure and weigh the significance or insignificance of things, people, and “stuff”, that matter to YOU. By acknowledging who and where YOU are YOU also get to identify YOUR standards and REQUIREMENTS as it relates to how and what YOU do going forward. Once YOU acknowledge that YOU haven’t been loved or that YOU don’t trust or that YOU haven’t experienced joy, then YOU can recognize those things when they happen again. Acknowledgment stops the routine of access that the past has on YOU and YOUR life. Acknowledgement is where YOU lay out the facts. The facts are indisputable. The facts, particularly those of the past, do not change. The facts happened. And it is very easy to believe or not believe in ourselves because of the “facts”. Because the facts, especially when used to criticize or condemn us, have the ability to beat us up and down with the reality of ourselves, especially our old selves. That creates the idea and impression that we are who we were and that leaves us susceptible to the repetition of being whoever the facts say that we “were”. And the facts always seem to know how to bring up the worst about us at the “best” time. The facts have every right to us because the facts are us, and no fact is wrong for being the fact that it is. The fact is always true about the past, but facts can lie about YOUR future. And that truth is a fact, solely up to YOU! I don’t really find much benefit in reflecting on the past. Reflecting, for me seems to trigger a certain feeling of ownership and I don’t want to be affiliated with my past in that capacity. I’d like to be a former owner. I can be proud of that. Yes, I used to own that. I sold it, to the past. I brought a future! Part 1- Write down the facts about YOU. Write as much as YOU can remember. YOU don’t have to tarry over details and explaining the entirety of every experience or event but write down enough so that YOU recall that fact. Write the hurts, the pains, the feelings, the emotions, the mistakes, the issues, the secrets, the habits, the challenges. Write down the facts. If YOU did something, write that. If someone did something to YOU and it is a fact that has helped create the past that YOU are trying to move beyond, write that. If YOU hurt someone, write that. Write the sentence in full, like “I __________ (what YOU did) to or from or about ___________ (the persons name)”. Write the emotions or feelings that described YOU. Write as many facts as YOU can remember. DO NOT LEAVE ANYTHING OUT! I’m not going to tell YOU to mail it or share it with anyone so don’t leave something out fearing being revealed or discovered. This isn’t a confession letter. YOU can burn or shred it after this exercise. But, WRITE EVERY “BAD” FACT YOU KNOW ABOUT YOU! Part 2- Go to the bathroom or anyplace with a mirror where YOU can have a moment of uninterrupted privacy. (I had to do this at 3 o’clock in the morning to ensure that no one disrupted me.) Take what YOU have written with YOU to that mirror. Now read it to YOU. One sentence at a time, looking up at YOURSELF after every fact. For as long as it takes. Acknowledge every fact about YOU. The facts are hard to hear. They are very hard to hear. And it is hard to hear them about YOU. It is hard to admit them. It is hard to acknowledge them. Some of the facts are very hard to understand. And there are some facts that make YOU remember other facts and realities that YOU were completely unable to control or prevent. And that makes YOU feel shame and guilt and hurt. It makes YOU feel helpless. But keep going. Some of the facts happened when YOU were a child. Some of the facts happened because YOU were not capable or able to avoid them. Some of the facts YOU are totally and completely responsible for. Some of the facts were definitely preventable and avoidable but YOU did them or were a part of them. And now they are the facts. Now they are YOUR past. As YOU read them, don’t try to rationalize or explain them to YOURSELF. Do not try to justify or make excuses while YOU read them. DO NOT FEEL ASHAMED OR GUILTY WHILE YOU ARE READING THEM. Just acknowledge them. Acknowledge that they happened. Acknowledge that YOU are who those facts say that YOU were. So if those facts say that YOU were molested, raped, abused, abandoned, ridiculed, bullied, threatened, hurt, harmed, hated, … ACKNOWLEDGE THAT! If the facts say that YOU lied, stole, hurt, manipulated, cheated, abandoned, avoided, … ACKNOWLEDGE THAT! Acknowledge YOUR facts. Once YOU have acknowledged them, it is hard for someone else to announce them in a manner that breaks or beats YOU down for their validity. Now that YOU are able to say them about YOU, what anyone else says is just that, what they say. I AM RESPONSIBLE FOR NOW. I have the right and responsibility to live, NOW! I give myself the right and the freedom and the choice to be healed, to be forgiven, to be trusted, to be loved, to be proud, to be bold, to be sure, to be supported, to be helped, to be at peace, to be happy, to be cared for, to be cared about, to be understood, to be free. I deserve to be free. I deserve a new truth. I deserve a chance and I give myself that chance, NOW! Now tear that paper (of YOUR facts) up or burn it or drown it or shred it or destroy it in whichever manner that is accessible to YOU at that moment. It doesn’t have to be ceremonial, just certainly. Just don’t put them away, and DO NOT HIDE THEM. YOU need to get rid of them for this exercise of the process to be successful. YOU have acknowledged YOUR facts, and then leave them as they are, YOU can move on now. It’s over, the facts are out. The facts happened. YOU don’t have to be proud of them, just proud of YOURSELF for having come through them. The real fact is that whatever it is or was that happened to YOU, it did not end YOU. It may have done a lot of things but it did not end YOU. And because it is not YOUR “end”, there is still an opportunity to continue, go, do, and become. Despite the facts. In spite of the facts. Some good will come of and to YOU entirely BECAUSE OF THOSE FACTS! And don’t worry about reflecting on them or remembering them in a negative way, “people” are going to do that for YOU. People are going to try to remind YOU of YOUR facts. People are going to try to restrict or redirect or refuse YOU because of YOUR facts. So they will come up again, but you’ve acknowledged them and for that reason, they can’t break you or beat you up like they once did. In fact they will help YOU as YOU decide and determine what to do, what to say, what to be. Because those “facts” showed YOU what YOU did, what YOU said, what YOU were… And YOU ARE NOT THAT ANYMORE! Not if YOU don’t want to be. The truth is that YOU get to produce new facts. YOU get to make new facts. YOU get to move on, regardless of those facts. The past is a fact. The future is whatever YOU decide it to be. Acknowledge that. This entry was posted in Inspiration, Love, Motivation, Poetry, Quotes, Reflection, Self-Love, Uncategorized and tagged Acknowledge, Facts, Past, Perspective, seethepoet, Truth, Your on March 18, 2014 by seethepoet.